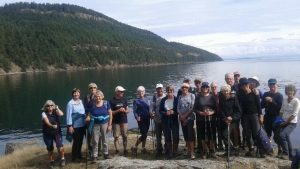 Saturna Island Group – Sept. 2018 Wow! Careful there!! 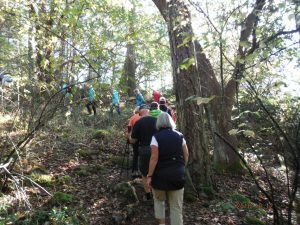 This group is for members who want a rigorous hike, with varying degrees of difficulty, lasting 2-3 hours. In addition to a regular hike we may also schedule an alternate, longer more rigorous hike. 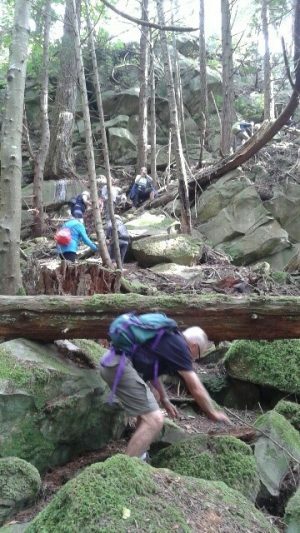 Members should be reasonably fit, wear hiking shoes or boots, bring water and a snack. Many bring hiking poles on the more hilly hikes. After the hike, coffee is our reward! 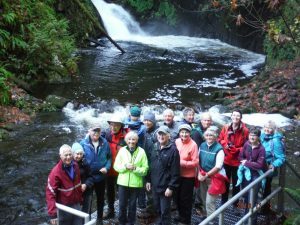 The hiking group meets Fridays at 8:50 am. at the Fowler Road parking lot. 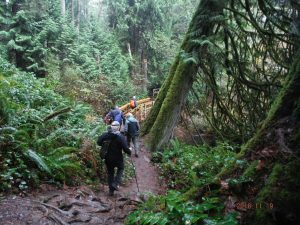 The group relies upon members to suggest and lead hikes. When proposing a Hike, please refer to the schedule and provide the date & destination. When submitting your specific hike details for group circulation, kindly aim to have these e-mailed to me latest by the Wednesday afternoon before hike day. When considering to lead a hike, you may find that our list of hikes will be of use. The data has been compiled by Mick Phillips and, while not exhaustive, provides a comprehensive list of locations tackled over the years by the CB55+ Group. We’re indebted to Mick for pulling this together for us. A number of these will be quite familiar to most of the Group however, for those members less so, a quick “google” will provide you with more detail. That said, if anyone has other fresh ideas on where we could hike, please do feel free to bring them forward. As with new leaders, new destinations will always be welcomed. Protocol: Change of Plan/Cancel – Last week brought up the question of having a protocol in the case that a hike is changed/cancelled. As you know, we are a well prepared group and while the numbers may decrease in inclement weather we seldom change plans or cancel. But, occasionally it may be prudent to do so. What we will do is if conditions are in doubt, the hike leader and myself will make make an assessment and if there is a change send out an email by 8:00 am. If no message, no change. Please check your email before heading out. Protocol: Proceeding Directly to Trail-head: If you are proceeding directly to the trail-head please advise the hike leader in advance and leave a contact number if you have one. 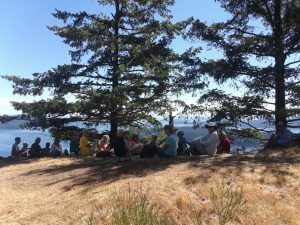 The hike leader and/or myself will include a contact number in the weekly hike notice. This requirement is necessary in case something comes up on the way to the trail-head, either with you or the rest of the group. I realize that there are places where cell coverage is not good, but we will do the best we can. 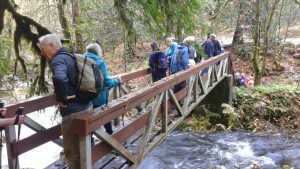 Lynda Corby and Janice Macdonald will lead the hike at Thetis Lake. Meet at Fowler Park at 8:50 am. as usual to carpool to the main parking lot at Thetis Lake. If you plan to meet us there, arrive by 9:15 am. We’ll hike Lower and Upper Thetis Lake. Bring your lunch along. We are hoping for a nice day and a picnic afterwards at the Main Beach. Parking is free until May 1. If the weather is nasty we’ll head to the Six Mile Pub instead of a picnic lunch. 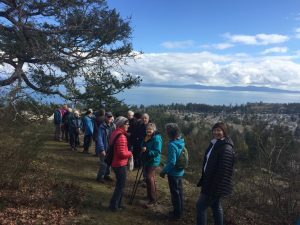 Mick will lead a longer hike on Good Friday, April 19th, in Gowlland Tod Provincial Park. The trailhead is at the Mt. Work parking area off Willis Point Road. We’ll head down to McKenzie Bight before climbing up the Cascade trail to the main Timberman Trail. After that, it’s a ramble up towards Squally Reach and beyond, possibly taking the Middle Trail towards Jocelyn Hill. Return along Anderson Ridge. This will probably take between 3 and 4 hours. I know – lots of probables here. That’s because the weather forecast is a bit iffy and it is Good Friday so numbers may be low. We can make adjustments as necessary. 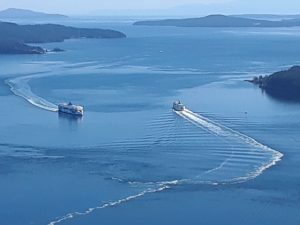 If hikers just want to do the McKenzie Bight loop and return to the Parking area, that’s OK too. You will need good hiking boots – it’s going to rain tomorrow, Thursday! Poles useful. Bring a lunch, a drink, and dress for both April showers and sun. . . . Meet as usual at Fowler for a 9:00 am. departure. Let me know if you are going directly to the Trailhead!